Introduction and objectives Pre-treatment Vitamin D deficiency (VDD) is well described amongst adult TB patients in Malawi and has been associated with impaired mycobacterial immunity. Anti-TB drugs and antiretroviral therapy (ART) for HIV may induce hepatic Vitamin D metabolism, further reducing the serum concentration of active metabolites including 25-OH D3. This study identified risk factors for baseline VDD, assessed the effect of therapy on 25-OH D3 concentrations, and evaluated whether VDD deficiency has prognostic implications for treatment response. Methods Adults with pulmonary TB were treated with standard 6 month therapy. Serum 25-OH D3 concentrations were measured at baseline, 8 weeks and end of treatment. Serial sputum samples were used to model the rate of bacterial elimination for each patient. Patients were followed until 1 year post-treatment and final outcomes were defined as favourable (stable cure) or unfavourable (failure/relapse). Linear and logistic regression analyses were used to identify risk factors for VDD and assess relationships between VDD and treatment response. Results 133 patients were studied. 75 (56%) were HIV-infected and 24 (18%) were on ART. 118 (89%) had favourable and 15 (11%) had unfavourable outcomes. The median baseline 25-OH D3 concentration was 57.3 nmol/l. 47 (28%) patients had concentrations <50 nmol/l, representing VDD. On multivariate analysis, neither HIV status nor ART influenced baseline 25-OH D3 levels, but lower concentrations were reported in patients who were recruited during the cold months of July/August (p = 0.001), suffered food insecurity (p = 0.035) or had a lower baseline Body Mass Index (p = 0.047). 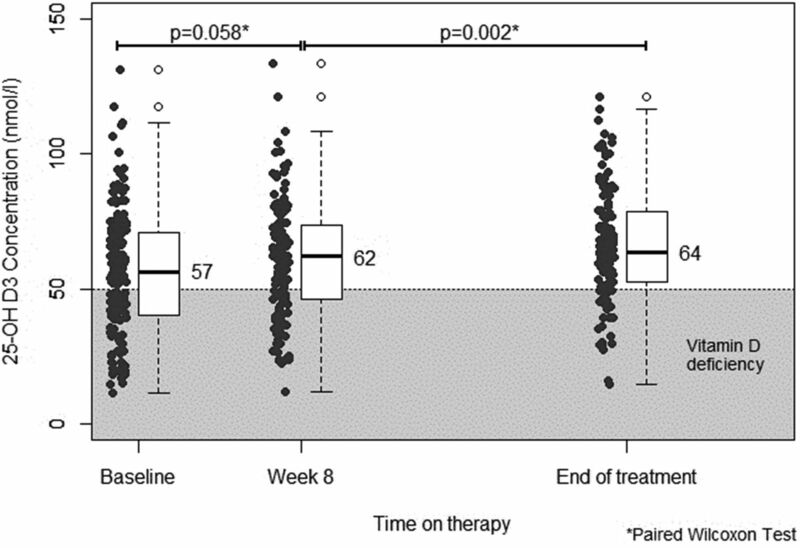 Without specific supplementation, 25-OH D3 levels improved during TB therapy (see figure). There were no associations between 25-OH D3 levels at any time-point and the sputum bacillary elimination rate or final clinical outcome. The presence and extent of VDD in Malawian TB patients was determined by environmental factors (sunlight exposure and dietary intake) rather than HIV status or ART. 25 OH D3 levels improved during therapy, suggesting that induction of Vitamin D metabolites by anti-TB drugs or ART is adequately compensated by improved Vitamin D uptake during disease recovery. VDD did not have prognostic implications for treatment response.